Fished the White river again today with Larry Richards. The water was projected to rise early then fall out and thats exactly what happened. I got on the rise early in the middle of Cain Island shoal and landed a nice 20" brown trout on the very first cast. I noticed that the water was getting dirty fast so I started bumping down with the front end of the rise. 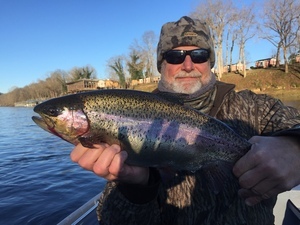 The next fish was a great Rainbow. We dont see many rainbows this size any more. The browns were biting like mad on the front edge of the water until around 9:15. Larry landed 7 browns and a great rainbow before they quit biting for us in the White Hole. We continued to chase the water all the way to Tool Creek before turning back. We landed one more brown at the head of Wildcat and that was it before lunch. After lunch I headed back up the river hitting every hole I knew of with little success until 2:30 and then it was like someone flipped a switch. We landed 7 more brown trout in the last hr. 15 browns in a day is a good day but I wish they would have been scattered out throughout the day a little better. I have one more day with Larry so we will see what it brings.